Having designed the branding and interiors, ‘i-am’ associates are proud to announce the launch of Chilango’s new outpost which opens today, Tuesday 11 December at 64 London Wall, EC2M 5TP. A long-standing and award-winning relationship, London Wall marks the 4th site that ‘i-am’ have designed. Graffiti art by Broken Fingaz, a shrine to the Virgin of Guadalupe, Lucha Libre masks, neon signage and an open kitchen are some of the many design features that make Chilango stand out from the rest, so pay a visit, take a peek, pick up a burrito and find out why Chilango has been voted number 1 Mexican restaurant by Zagat in both 2011 and 2012. 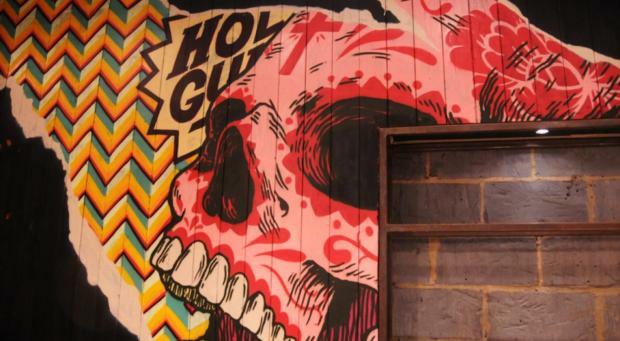 Chilango London Wall opens today!